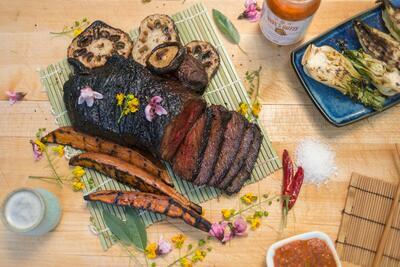 Our 100% Fullblood Wagyu Tri Tip Roast hails from sirloin primal. It’s triangular in shape because it’s cut from a section where the sirloin meets the round and flank primal. Our friends, Paul and Andre paid homage to Japan by creating this lovely recipe using ingredients that create a mouth-watering and elegantly flavored Tri Tip. Uncover and cut in half, where the grain changes direction, then cut each piece against the grain into 1/2” slices. Enjoy with your favorite side dishes!